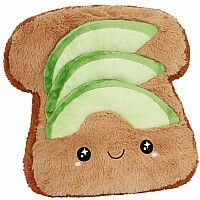 Home Shop Online Tween Squishable Avocado Toast - 15"
Craving some savory after your morning workout? Need to fill your tummy with squishy satisfaction? Want to look like an Instagram model while doing it? Might one suggest the light-yet-ever-so-indulgent Avocado Toast? Aztecs, Australians, and attractive yoga practitioners doing Sun Salutations on a perfectly decorated rooftop terrace overlooking Central Park all agree that it's basically vegetable butter...on toast. Which is great! Fluffy, puffy pals are super soft and super cuddly, irresistibly appealing and perfect companions for TV time, bedtime, anytime! Filled with 100% new polyester fiber. Measures approximately: 18.00 x 17.00 x 6.00 inches..